A Whole Year of Yuck! Holidays of Horror! It's the Plush Calendar of Dooooom! 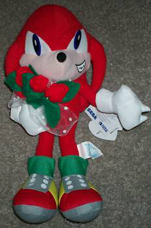 Thanks to ToyNetwork churning out so many stupid, tacky, un-fitting and Sonic-sullying "holiday" plushes, they must all be corralled into one place to try and contain the dumb! 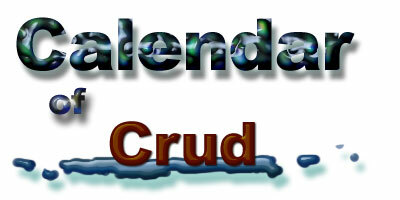 So...presenting the "Calendar of Crud", which is here to irritate your internet screen with a really lame photo showcase of all these lousy dolls. They're divided into different holiday catagories, because there were always several plushes for each 'occaision'. Sonic is wearing a cape and mask, it must be Halloween. But what is he supposed to be? "Something that wears a cape and mask". Where is the effort here? They didn't even give him a theme! And you can't take off the mask either. Here's an Amy as either a fairy or a witch. Amy, they didn't even bother to dress up. She's just holding some jack o' lantern, which is likely a left-over from something else. She still suffers from wonky-eyes, messed up mouth and eye-lash attack, so even without the phony theme, she's still not any good. Credit to ZenkaiKenny for finding this fiendish photo. 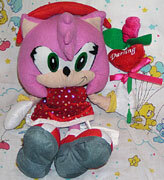 This is another of the 'minorly accessorized/rehash' plushes. The only thing "Halloween" about Sonic here is his 'pumpkin'. The letters are difficult to see, but that's not the main problem--which is the pumpkin looks a LOT like a giant orange! It is even textured like an orange & the leaves look JUST like orange leaves. A pumpkin leaf is broad & complex, totally unlike the leaves here. It's like they stole someone's orange. Oh no. Now this thing is just a monstrosity of stupid. It's embarassing how bad this thing is! First, the costume has no theme. A wizard hat (likely stolen from the above Amy Rose) in purple, a pumpkin t-shirt (why? that's not a costume) and then of all things, PINK POLKA-DOT TIGHTS! Sonic's parade of pathetic costumes continues with this scurvey pirate outfit. With a cheezy, tiny hat & bogus looking eye-patch, Sonic's all faked-up for Halloween once again. 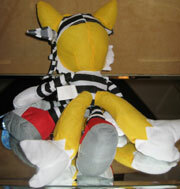 Plus his mouth is sewn on vertically & his belly dot is pointy. Not to mention the cone-like wrinkly spikes. Mutant gear keeps Halloween 'scary' for the wrong reasons! Discovered by Fuzzball Raccoon. It's Halloween in Mushville! 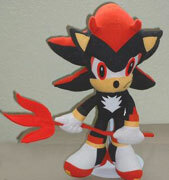 Shadow is holding a lame excuse for a pitchfork & has red devil horns on the still-too wide stripe of red. They can never fix the faces on these poor things. The devil? give me a break. Even though 'winter' isn't a holiday, they seem to be trying to cram the crud in all year long. Here comes "Snow Tails". This doesn't make any sense really either, he's got on a 'snow suit' obviously but why the top hat? Is he trying to imiatate Frosty the Snowman? Scrooge? The black pom-poms and hood (yes thats what the small scrap is in the back) seems to suggest that this is some kind of snow-man costume. But really who dresses up as a snowman for no particular reason? He has a snowman head on a stick...is it a lolly-pop? A mask? Does he like decapitating flat snowmen? The doll beneath still has problems, such as semi-flat tails, one eye not being on streight -at all-, and over-stuffed nearly circular feet. It's not as bad as some, but it still doesn't make sense. Photo discovered by: Fuzzball Raccoon. Sonic Holiday Un-Special Page to see them. 2 holidays together for more to make fun of at once! 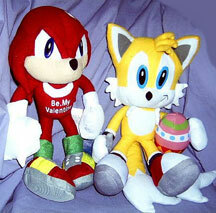 Here we have "Valentines Knuckles". How Valentines is he? NOT. All they did was write onto his body (What is this, a tattoo??) "Be my valentine" like one of those terrible cheap bears that show up every year that no one actually wants! Argh! Sonic stuff is not some cheap holiday throw-a-way! 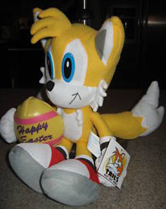 Easter Tails gets a similar amount of effort with a tacked on "Easter Egg" and nothing else. 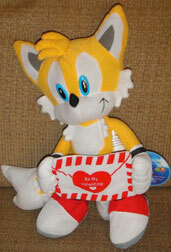 However, this Tails isn't particularly 'mutated' that badly. 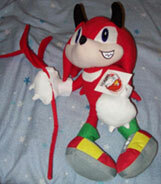 Yes, the theme is corney...but the plush itself isn't the "Worst thing ever" like some of their other failures. Hmmm. Are you ready for a double shot of lame Amys? Too bad. If you need to guess, these are probably Valentines and Easter Amy. Again, they swapped out the fabric for her dress (with polka dot!) and added some annoying accessory. In this case, the heart says "Darling" on it and the flower also has words. However, you can't really read them in this photo. Notice Valentine Amy's black eye rim? It's mostly missing, save for a few tiny scrap like bits and her eyelashes. 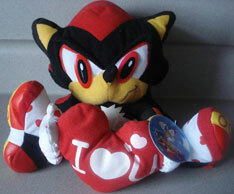 It looks like something has gone wrong with this plush...aside from the lame theme and wrinkly arms! Don't be this thing's valentine! 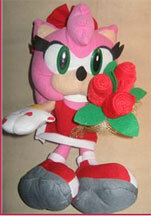 Here's another Amy that has to be assumed is for V-day. She's got a boquet of roses and some mysterious hearts scattered on one glove. Her headband has also had a bow added, and her dress is cut low in front (note pink showing at top) While somewhat mutant (doughey feet, giant plastic eyes) she's not super horrible. Discovered by Streakthefox. Just what is going on here? It's anybody's guess with this terrible Tails! 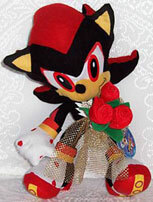 Hearts and flowers are hardly Shadow's style, but that doesn't stop ToyNetwork from creating this shabby Shadow doll! He's sure to insult Shadow fans with his heart-fabric shoes and gloves, while his dome-like messed up head and ultra-wide stripe ensure he's ugly. Their problem also remains with putting on plastic eye-centers that are much too large for the doll, making it look drunk/scary/stupid. He's holding a boquet with gold lace...and the title for "Very out of character"! Photo discovered by SuperSilver. How do you celebrate Valentines? By putting on the stupidest hat you can find and wearing a shabby red shirt? NO. That's for the calendar of crud Sonic doll to do...poorly. Now with extra stupid! The buckle is on the wrong side of his shoe too because they don't care about Sonic at all and they glue the worst hat ever onto his head and the doll looked like junk from the beginning. Photo discovered by BlueBlur. 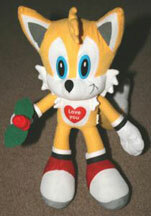 This Valentines Tails could have had a bit of potential. If the execution had actually been any good. Lots of characters appear around this holiday holding a cute card or a heart or something, which is clearly what Toy Network was going for. But, because their doll pattern isn't very good (still) it doesn't really work. The envelope he's holding is wrinkly & a bit wiggly but it says "Be My Valentine" in the heart. The Tails is otherwise unchanged though. (Not as if that's a good thing, with his oddly shaped ears, strange face-edge fur, kind of scary eyes, shrivelly shoes & general not-so-great composition) While this one's not great, it's also not super messed up, absurd or plain awful like a lot of the others here. Which makes it not fit in. Not even Ireland is safe from the bad doll attack! Here's St Patrick's Amy. This day is supposed to be lucky, but whoever obtains this nasty doll sure isn't! First off: cruddy, wilty, wrinkly crown (why? Is she the queen of lame?) Then, her dress is just green fabric with a picture of a crown on it and the word "Irish". Who wears just a shirt with 'Irish' on it? No one! Also, they've changed her boots to green, and none of it goes well with her regular color. Her face is flat...but curiously enough it's not as bad as some of the previous Amys. This Sonic is very strange. IS he really for St. Patrick's day? He has no other accessories, but his shoes have been switched rather inexplicably to a green theme. If he's NOT for St. Pats...then what's going on here? Super lazy? Whatever it is, it's mutant gear! 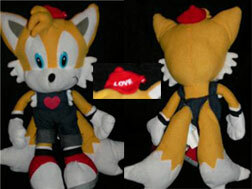 The plush itself isn't too awful...but the green shoes are very strange. Discovered by Berzerker. Now it gets confusing as the holiday horror show keeps turning around the calander. You've ALREADY seen Easter Amy to the left...so what is she dressed for this time? What's with that stupid hat? 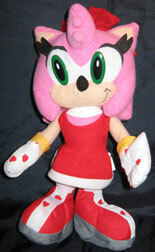 Would Amy Rose really wear that frumpy dress? And who decided to sew her mouth on TOTALLY SIDEWAYS? Ugh. 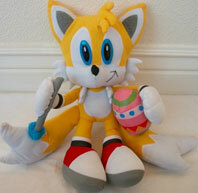 "Easter Amy" All they did was sew on a basket and bogus bonnet to claim it's an Easter Plush. Unfortunatly, there wasn't anything to do about her horrible eye-positions, and groucho-black eyelashes. This thing is messed up! How wrong is it that Shadow wears a purple 'happy easter' shirt? TOTALLY! More huge-stripe and fly-eyes mess here, the stupid shirt is just the barfy icing on the mud-cake! 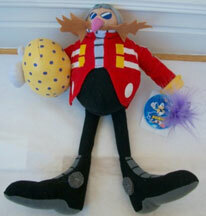 Sonic is ready to decorate his really tacky egg with a rather mutant paint brush. The egg isn't even Easter-like, with bright zig-zags...but that's the least of it's troubles. As you can surely see, Sonic's feet are almost BALLS on the ends of his legs. The bottom of the shoe is so puffy that it has lost all it's shape. Toy Network Sonics all also seem to suffer from 'bent down ears', and this one is not much different, but at least 1 ear is making part of an effort to stay up. However, the face on this one isn't 100% horrible. Not even moms are safe from mutations! Now just what is this. Come on. 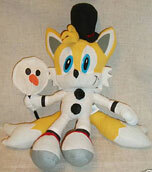 Another bogus plush, this time with a really mutant 'hat'of some kind. It's obviously some sort of attempt at Patriotic Sonic but it's just so miserable! No one can even tell what that horrible hat is supposed to be. It's like a stars and stripes ice-cream cone started trying to eat Sonic's head. 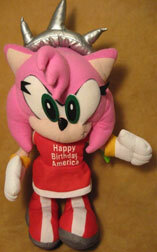 If toy network wants to make horrible Sonic dolls, the least they could do is leave poor America out of it. But, they go for the bizzarre and annoying on every level so not even the USA is safe from attacks of 'badly made'. Amy here has wrinkle spikes, a horrible anti-fashion USA Flag dress, and melty legs. Tails is dressed like Uncle Sam, and Sonic has a slap-on "Home of the Brave" shirt and phony flag. You'd have to be brave, to tolerate these plushes! and the knuckle spikes are small and shrivelled, but it is far less than their usual offense. His head spikes are kind of oddly done, but the tail curve and body size is actually starting to make sense. This guy doesn't even seem like he belongs with the above monstrosities. Could they actually be making an effort? Photos by kaji123. 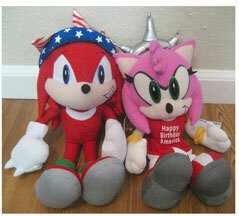 Not 1 but TWO dumb 4th of July themed Amys? 1 was more than enough to try & wreck up Independence Day. Now here's "Liberty Amy" with stupid silver random 'liberty crown' thing... the statue was never even silver, it was always brown or green. The crown looks like heavy metal spikes or something. Her dress now says "Happy Birthday America", but this doll is so ugly it guarentees an UNhappy birthday with stubby limbs (shoes sticking out of dress!) fat ears, and horribly positioned too-big plastic eyes. Her expression is frowny too...but with that junky crown... no one would be happy. 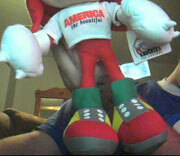 Photo discovered by: KatAndSilver This is probably part of a more complete (and ugly) "Uncle Sam" type dressed Sonic doll. It's got the tacky nonsense pants but no stupid shirt. Why are the buckles on TOP of his shoes? 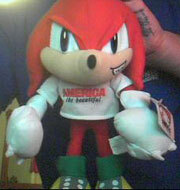 Boy Knuckles doll here sure is....crazy....for the 4th! (Or something) This overzealous looking plush looks like it has that stupid "America" themed headband/crown/bandana (what is it even) on too tight & it's pulling his face up. What are these crowns? Obviously it's the same Amy as above but nobody ever wore these trying to be like the statue of liberty. The statue started out copper colored then turned green! It was never silver or flag-themed with inexplicable cones all over. Why do they want to dump on America with so much dumb from these dolls? July? Jul-SIGH.